Cosmetic and Family Dentist in Glendale | John S. Asano, D.D.S. 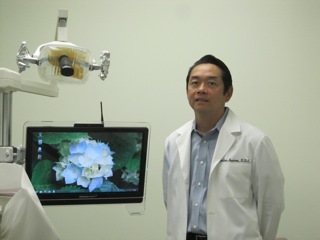 Dr. Asano is a native of the Los Angeles area, attending high school at Fairfax High, then proceeding onto UCLA. Following his degree in Biology, he spent two additional years at Cal State University Los Angeles completing his Master’s Degree thesis. Dr Asano returned to his alma mater at UCLA for his dental degree before entering private practice. Dr. Asano has been in practice at the Glendale Exchange since the early ’90’s, and continues to treat all manner of general practice cases; both routine and complex. Dr Asano has built his practice based on giving patients the best treatment options available, and as such continues to strive toward dental excellence through continually evaluating and incorporating technology and learning new treatment modalities. Dr Asano is a member of the American Dental Association, the California Dental Association, the San Fernando Valley Dental Association, Glendale Chamber of Commerce, and past president of the Academy for Excellence in Dentistry. He also was part time faculty at USC Dental School, and currently is a member of the Spear Study Club, which incorporates other dentists and various specialists such as Orthodontists and a Periodontist to regularly discuss complex cases. Outside the office Dr Asano, a low handicap player, enjoys golfing with his sons, and serves as tournament chairman for the Asahi Golf Club.